The terms inbound and outbound embody a type of cultural shift in the entire way of how marketing works, particularly across different channels. To accelerate the sales and get qualified leads, companies are required to function hand in hand with outbound and inbound marketing while building a strong strategy to power it all. Well, the similarities of both the strategies stop at being the ways to generate leads. Efforts that include SEO, blog posts, social media, and webinars come from inbound marketing. Inbound is all about getting the message out to people that are seeking it. The idea is to attract people automatically while they go about their daily activities. Using this, one can align the marketing messages to the buyer’s journey, the very process any potential customer goes through before making a purchase. Outbound marketing, on the other hand, is the approach that companies have taken for numerous years and is generally termed as ‘traditional marketing’. It includes efforts like direct mail, cold emails, print ads, cold calls, and events. This gets the company in front of people regardless of any specific audience’s level of interest. While this difference stays, when combined strategically with strong inbound marketing approach, outbound marketing happens to make a difference indeed. Truth be told, frankly, inbound marketing isn’t enough as at this time seemingly everyone is making use of inbound marketing so, the channels are becoming noisy. Another problem with Inbound Marketing is you don’t have direct control over your leads. You will get quality leads (of course) along with bad inquiries that waste the time of your Sales Development Reps (SDRs). In Outbound Marketing, you have the full control to whom you are sending contents or business proposals. You can even target specific company size, individuals, and companies with specific revenues. You have more access to which customers you will bring into your sales pipeline. If any company isn’t a good fit for your business, don’t add them to your prospecting list. So, the marketers are required to give their Inbound Marketing a boost and the impact of Inbound Marketing is not like it used to be back then. Once this realization occurs and one decides to implement Outbound Marketing back into the field, it should be in a way to complement the inbound marketing efforts. Some of the major indications that suggest it is time to change the game. 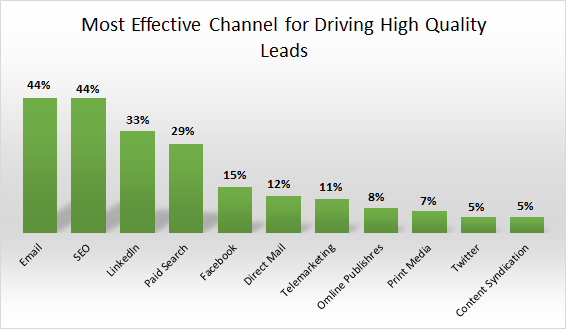 Outbound Marketing and Lead Generation efforts mostly include marketing tactics that come both under online and offline. ● Events: To find new prospects at any event feels natural but falls in the outbound marketing camp. With a booth at an industry event or a small gathering of your own, events make a good way to get in front of customers and reach personally as opposed to the noise of the online world. The presence at the event including the company booth and talking to attendees are strong outbound moves. ● Telemarketing/Cold Calling: Build a list of qualified prospects through online research and then, start engaging with those prospects by calling them directly. In this way, the outbound marketing activities can deliver the company’s message and provide the solution to these people. ● Cold Email Marketing: With a strong email marketing strategy the message can be tailored as per the individual and then can be adapted to individual’s actions. It shines as a content asset with higher-level executives, as they mostly don’t browse the web and could be harder to reach them through that. Sending a direct and personalized email piece is a powerful way to reach these C Level Executives and decision makers. ● Public Relation: Reaching out to the prospects while introducing the people behind the brand keeps them connected and loyal. Meetings, webinars, podcast, and seminars are a good way to showcase the business to acquire new customers. Outbound Marketing is effective for targeting choice leads, businesses happen to disseminate their message on a variety of platforms and experiment with different media. The personal first contact could be an ideal start through sales and marketing events, cold calls, and emails. Don’t afraid of new buzz that GDPR will kill Outbound Marketing. Putting a strategy in place to drive the efforts is always required when the company wants to work with both inbound and outbound marketing seamlessly. These strategies should outline the goals that are to be achieved and how to go about the plan to achieve them for a clear idea of the actual execution. To make the firm recognized in the best possible way, getting a grip on the content strategy has got to be the foremost step. It is not required to hang with only one marketing strategy as the chances are your competitors might catch the low-hanging fruit. To reach the planned goals, there should be no room for a complicated technology as there is no time to figure out the new technology. If one gets too caught up in the everyday functioning of the technology, then the time that is devoted to honing the inbound marketing activities becomes less. With compelling content, shoring up the SEO and dovetailing the efforts with outbound marketing activities, one is likely to go further. Combining both inbound and outbound methods could have multiplicative effects with the views, shares and potential customers. According to Marketo, outbound propel leads through the sales funnel much more quickly as most of them are nearly ready to buy. Then, based on the interest shown in your business, outbound marketing can come as an extension in building the sales pipeline. Kadenze (one of our clients) got 80% MQLs in the first month from Outbound Marketing efforts, says Jordan Hochenbaum, Co-founder of Kadenze, Inc. Ultimately, one cannot completely rely on one aspect of marketing and will have to combine the best of both marketing strategies and bring out the results for the business. The ideal marketing strategy would recognize the weaknesses as well as the strengths in both marketing ways and combines both in a cohesive message to have a comprehensive reach and increases the sales velocity. In the end, inbound and outbound are both teammates and not competitors. People are bored of seeing the same thing and need a catch. The mix of inbound and outbound marketing will certainly change with time and with technology adding new ways of interacting with people to enhance CX. So, the most important strategy is going to experimental and a mix as both the strategies are going to stay.